Last week I posted a blog about ways to creatively recycle book pages. 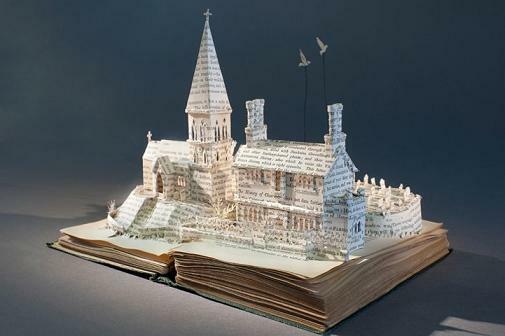 Su Blackwell, an artist from the U.K., creates three dimensional book sculptures made with discarded books. Many of her creations are scenes from fairytales and folk lore stories. Her work is reflective of the books she read and the fulfilling make-believe world she created while playing in the woods during her childhood. Blackwell went on to study arts, specifically textiles, obtaining a M.A. degree at the Royal College of Art in London. “The Quiet American” was her very first sculpture which was created from a second hand book called the Kao San Road she purchased on a trip to Thailand. She says she reads books once or twice before she begins her creation of a scene from the book. The trend of repurposing books to create art sculpture is becoming popular in many places, including here in Colorado. Artist Kim Keith, exhibits and sells her geometric shaped paper sculpture and other mixed media, at the Red Contemporary Gallery here in Steamboat. She says her creations keep “alive the tactile sense and physicality of “book”. http://bit.ly/PrThwI. 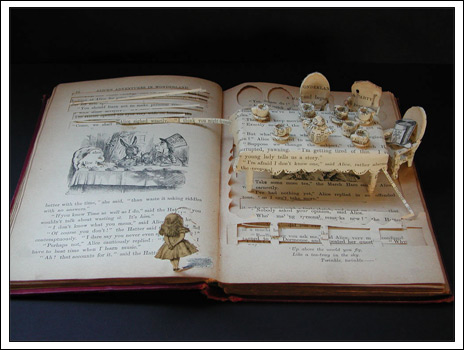 Click here for books on repurposing books for art projects. For more information, on the amazing work of Su Blackwell, please visit this link. http://bit.ly/RTrcwA. Hello there. I found your blog and this is the really well prepared content. I am going to mark the items that are avalable here.Thanks for the articles.